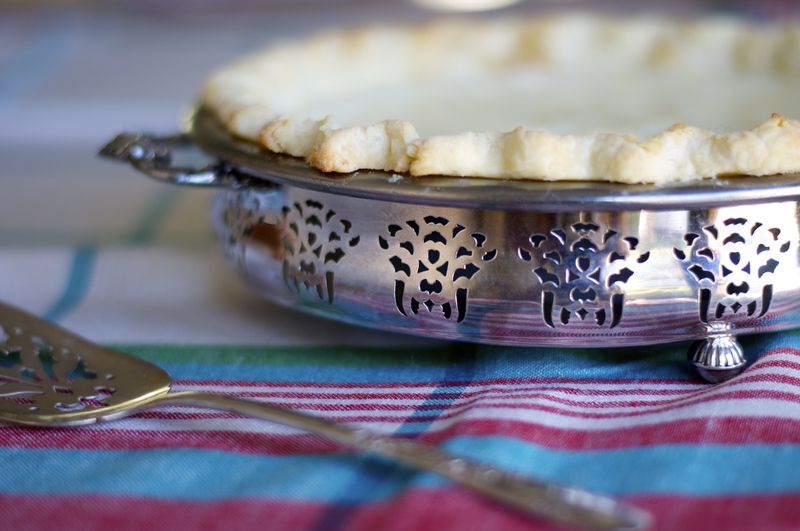 Category Archives: Pies, Tarts, Galettes, etc..
Posted by zucchinicarmama in Desserts, Pies, Tarts, Galettes, etc..
My parent’s home on Salt Spring Island has a small orchard and is, like much of the island, surrounded by blackberry bushes. The blackberries are perfect for the picking this time of the year and this year, our gravenstein trees are ready to harvest. While the gravensteins aren’t the best for baking with, we keep a supply of apples from our old King apple. (This year for fathers’ day, I got my dad a new one which I have since named B.B. King – these are his favourite and I thought the name was rather clever). The other trees in the orchard are great for cider and should be ready to harvest within the next month. We have a mechanism which cores and slices the apples as you turn the crank and which gets a lot of use this time of year (apple butter to come). If you are preparing a lot of apples, these are a godsend. To preserve our extra apples, we then freeze the cored and sliced apples for crumbles to come. This crumble (or crisp as you may wish to call it) is a slightly modified version of Betty Crocker’s Apple Crisp recipe, the main modification being blackberries. Preheat the over to 375 F. Fill a greased 9 x 13 inch glass dish with the fruit. Sprinkle the cornstarch over the fruit. Mix together the sugar, flour, oats, cinnamon, nutmeg, and work the butter into the dry ingredients with your fingers. Mix in the pecans and spread this crumb mixture gently over the fruit. Bake until the top is golden brown, the apples are tender, and the fruit mixture is bubbling (approx. 40 minutes). If the top begins too brown too much before the fruit is cooked, gently lay a piece of parchment over the pan to slow the browning. 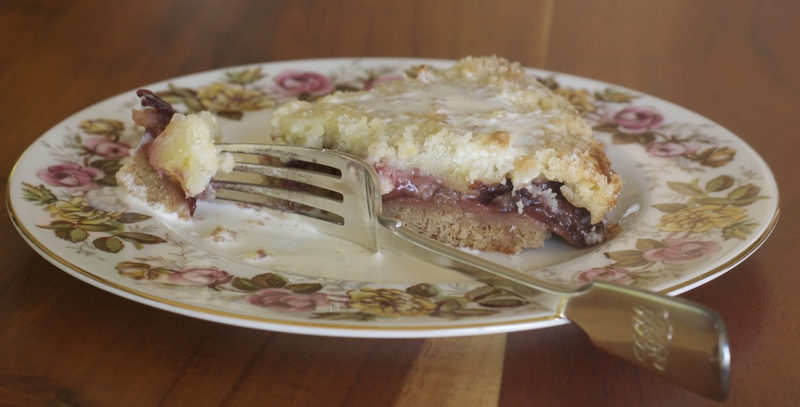 Posted by zucchinicarmama in Cakes, Desserts, Pies, Tarts, Galettes, etc..
Before plum season is upon us, I thought that I would share this tasty plum desert recipe that my family has been making for years. 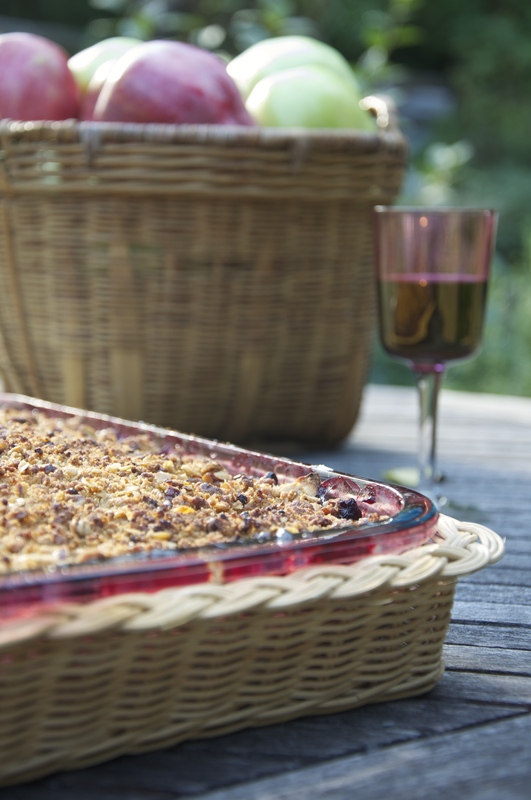 The dish is more like a tart than a crumble when completed, but relies on a crumble mixture in its composition. I used frozen plum halves from last season, but fresh plums are easier to work with. If you choose to make it with frozen plums, they do work just as well as fresh ones in this recipe. I recommend with frozen plums only slightly defrosting them before slicing – they are extremely hard to work with once fully defrosted. If you have access to lots of plums and want to freeze some, cut them in half, remove the pits and lay separated on a baking sheet. Place the baking sheet in your freezer. Once frozen, pop the frozen plum halves into a ziplock removing as much air as possible and return to the freezer. Combine 1 cup of the sugar and the salt; cut in the butter until the mixture resembles a coarse meal. Stir in the flour. Set aside half the mixture. Add the cinnamon, baking power and 1 egg to the other half. Mix until well blended. The dough will be quite sticky. 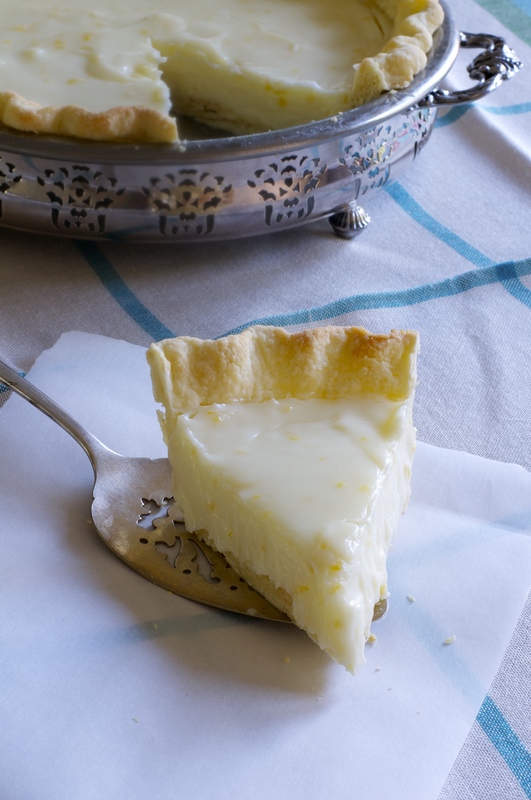 Layer the bottom of a 10 inch tart pan with the dough (just the bottom and not up the sides) by dropping teaspoons of the dough around the perimeter of the pan and then the centre, using a spatula to join and spread the dough evenly across the bottom. Bake until just starting to turn golden, approximately 10 minutes. While the pastry is baking, whisk together 1/4 cup of the sugar, the remaining egg, the cream and the almond and vanilla extracts. Remove the pastry from the oven, leaving the oven on, and spread the plum slices on top. I find it best to arrange the slices in circles beginning from the rim of the dish and working toward the centre. Pour the cream mixture over top and sprinkle with the reserved butter flour mixture. Sprinkle with the remaining tablespoon of sugar and return to the oven baking until the topping is nicely browned, 20-30 minutes. Serve warm or cold with whipped cream or unwhipped whipping cream, as preferred. I have only had the pleasure of travelling to Italy once. We had family friends who had a charming flat at the time in Rome. From there, we enjoyed the city immensely, always retreating to the lemon tree lined streets of their neighbourhood at dusk. I couldn’t tell you how old I was or how long we stayed. I do recall, among other things, drinking limoncello in the countryside as we wound our way through the hills, endless churches which I couldn’t appreciate at the time, constant cigarette smoke, streets that only a single car should have been physically capable of driving down at a time, and the most incredible foods (fried fiori di zucchine for example). Down the street from the flat was a small delicatessen that, among many other delights, sold both tiramisu and poached pears in foil pans. To this day, no tiramisu nor poached pear has ever been comparable, but my fond memories inspired me to try to poach pears at home with the following recipe which has been a family favourite ever since. This recipe is directly out of Jamie Oliver’s Jamie’s Kitchen. I, however, would offer one adaptation to those of you who think cooking with an amazing $40 bottle of wine is absurd. I have very successfully made this desert with cheaper dry, full bodied red wines over the years. Call me a philistine, but I promise you that the result of using a more affordable wine (but never “cooking wine”) in this recipe will still “wow” whoever has been lucky enough to be invited to dinner. In fact, I used an Argentine Cabernet Sauvignon for this “batch”. Preheat the oven to 375ºF. Split the vanilla pods and remove the seeds. Put the seeds and pods into an appropriately sized casserole-type pan that will hold all your pears snugly, and add the wine, sugar, cinnamon, and orange juice and zest. Throw in your thyme, secured together in a little bunch with string. Bring to the boil, turn down to a simmer, and add your pears, sitting upright. Put the lid on the pan and bake in the preheated oven for around 1 hour until the pears are soft and tender but not falling apart. They should be soft all the way through but retain their shape. (Sometimes they can take less or more time depending on the ripeness of the pears.) When they’re ready they will have taken on the flavour and colour of the wine and should smell delicious. By now the wine and the sugar will have thickened and the flavour will have intensified. 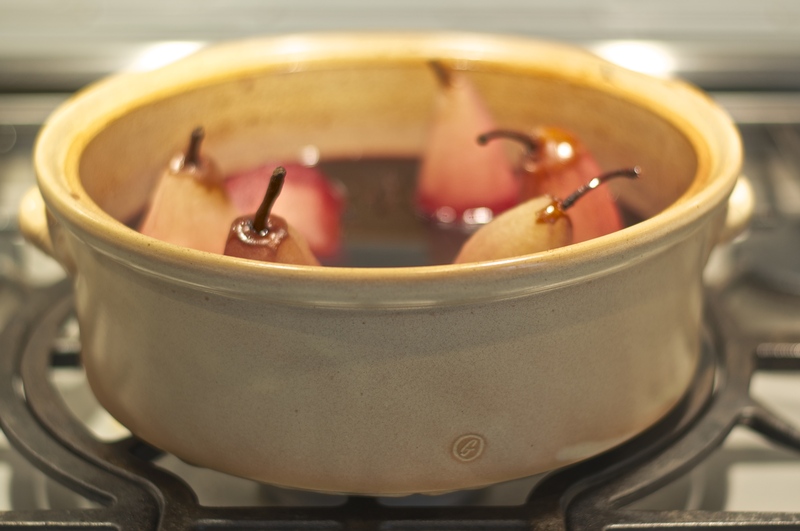 Remove the pears to a dish, turn up the heat under the pan, and reduce the wine by about half. Remove from the heat and add the butter – agitate the pan but don’t give it any more heat. This will give you a really intense, tasty sauce which is to die for. Put the pears back in the pan and leave until ready to serve. The pears are best served warm with the sauce and a generous dollop of crème fraîche. Posted by zucchinicarmama in Pies, Tarts, Galettes, etc..
Anona and her husband, Tak, are old friends of my parents and every time we get to see them it is a real treat. Their property is magnificent and about 5 years back when we last visited, we sat out on the deck overlooking the pond and the weeping willow I’ve always loved, shucking oysters for dinner to be followed by lemon pie as the adults drank Dark and Stormy’s. At the time I was so taken with the pie that we took the recipe back to Saltspring with us. I believe my mom made the recipe once since, so it is time to give it another go I figure. Incase you love art, as I was raised to do, here is a link to an article on Tak’s amazing work, Takao Tanabe’s love affair with landscapes, to give you a better feel of just how much beauty surrounds my memory of this lemon pie. Combine sugar, cornstarch, grated lemon peel, lemon juice, and milk in a saucepan over medium heat. Bring slowly to a boil, stirring constantly with a whisk. Add butter and cook until thick and smooth. Set aside to cool. When cool, stir in sour cream and pour into a baked pie shell. Refrigerate until ready to serve, uncovered at first and then covering once chilled (to avoid condensation).